There are many colors of gold, several being different tones of the same color. 24K, 22K, 18K, & 14K yellow gold each have their own tone of yellow with pure gold (24kt.) the most intense. When we think of gold, we think of polished jewelry with that familiar yellow tone. There are also many other colors of gold, including: white, rose, pink, red, green, blue, & purple. Blue and purple are the rarest. While pure gold is yellow in color, colored gold is developed into various colors by alloying (mixing) gold with other elements in various proportions. Almost all gold in jewelry is alloyed .For example, 14kt is 14 parts gold to10 parts alloy , 18K is18 parts gold to 6 parts alloy and so on. There are hundreds of possible alloys and mixtures, but the combination most common in alloyed yellow gold is approximately 50/50 copper and silver mixed with pure gold, giving the tone we are most accustomed to seeing. White gold is an alloy of gold and at least one white metal, usually nickel, manganese or palladium. White gold's properties and color vary depending on the metals and proportions used. The term white gold is used in the industry to describe karat gold alloyed to a whitish hue yielding various tones from slightly off white, pale yellow and even very pale rose. While a nickel alloy is hard and strong, in rare cases, people have an allergic reaction to the nickel and are more suited to a different alloy. A typical reaction is a minor skin rash and because of this, some manufacturers do not use nickel white gold but prefer to use a hypo allergenic alloy like palladium. After a white gold ring is cast and polished, a final layer of rhodium is applied which gives the piece the bright â€œchromeâ€� white finish. Rhodium is a naturally white precious, hypo allergenic metal. Many believe that the color of the rhodium plating, is actually the color of white gold, but it is not. Remember, all gold starts as pure and very yellow. The processes that follow in alloying bring it to its final color. 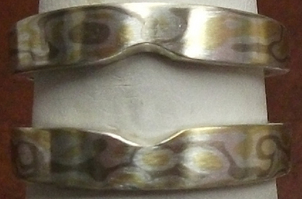 Below is double guard ring our caster just completed, using a mixture of different metals to create a swirl pattern in the metal itself. This is a mixture of 14K white gold (no rhodium), 18K Royal gold, silver and palladium.